University of Hawaii Lei Day Queen, 1936. 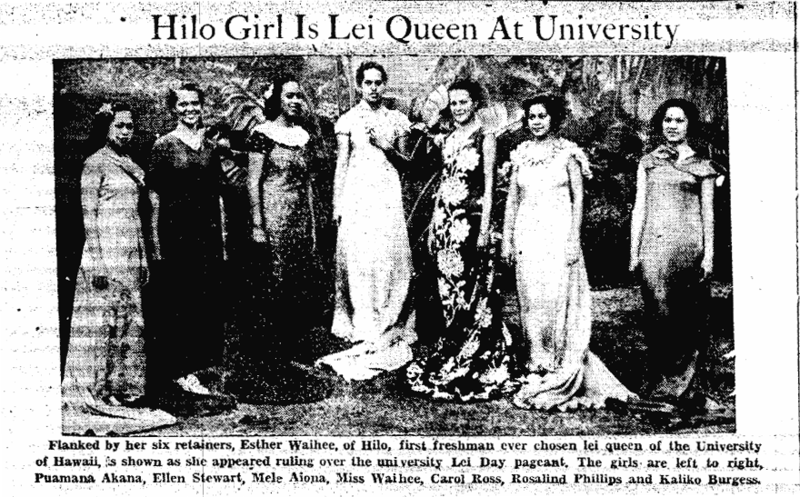 Flanked by her six retainers, Esther Waihee, of Hilo, first freshman ever chosen lei queen of the University of Hawaii, is shown as she appeared ruling over the university Lei Day pageant. The girls are left to right, Puamana Akana, Ellen Stewart, Mele Aiona, Miss Waihee, Carol Ross, Rosalind Phillips and Kaliko Burgess. Ka Hoku o Hawaii, Volume XXXI, Number 3, Aoao 1. Mei 13, 1936.